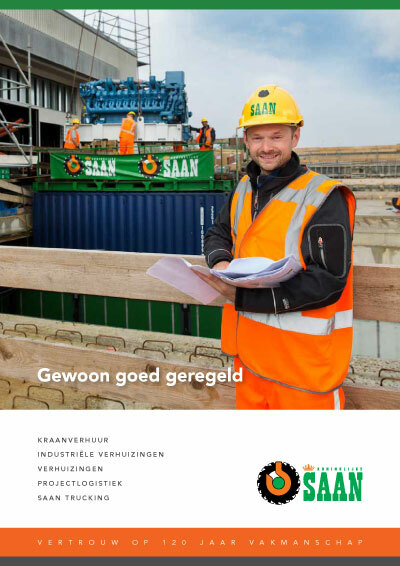 Saan supplied cranes almost every day from its Tilburg site to the construction site of Bol.com’s new distribution centre. The warehouse for the webshop is 17 metres high, making 135,000 square metres of floor area available (about 26 football pitches). Bol.com needed extra space because the company is expecting explosive growth in the next few years. The business premises, located in Waalwijk, are conveniently positioned for both the Netherlands and Belgium and they are also conveniently positioned with regard to the main roads connecting with the motorway and the container terminal to be built on the Maas. The construction company of Van Wijnen in Rosmalen was the main contractor for the construction of this mega-distribution centre in Waalwijk. Sustainable and energy-saving construction solutions were used. By this means they sought to obtain the BREAAM-NL certification with a grade of ‘Excellent’. Among other tasks, Saan’s crane operators lifted all the roof materials for ZND dakbedekking and provided assistance with wall installation for Nedicom. The construction job was completed at the start of 2017.